This post on Golden Age Comic Book Stories gives a hint why parents in the 1940-50's may have worried about the effects comic books had on kids. 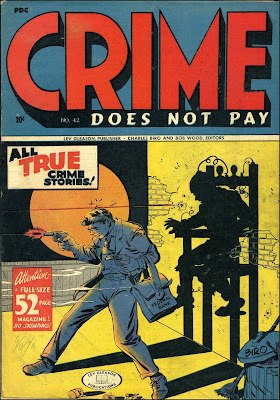 The stories from these six issues of Crime Does Not Pay may have a moral consistent with their title, but the images are more graphic than I would have thought for kids in the 1940's. This morning's Sunrise Serenade was "Romance Runs In The Family" by Glenn Miller. Enjoy the video below from YouTube. And I do mean hollow, literally. Nowadays, the expression "famous for being famous" is common, but today's examples are amateurs compared to one celebrity in the late 1930's who was not even human, or even alive. According to Life Magazine, as noted by Boing Boing, a soap carver living in New York began creating mannequins for upscale clothing stores. One of his models, "Cynthia," took on a life of her own. 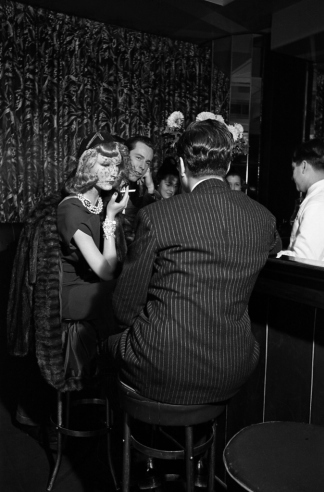 To promote his work, he began escorting her around town to all the hot nightclubs and parties. She eventually ended up with a radio show, a movie part, and an invitation to the wedding of Wallace Simpson and the former King of England, Edward VIII. The playlist for the March 28, 2012 broadcast of the Swing Shift Shuffle has just been added to the playlist filing cabinet. 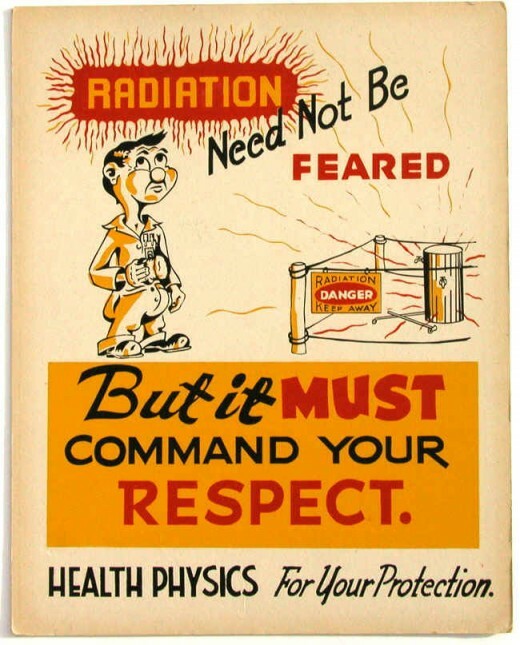 According to Retronaut, safety posters like this one were produced at the Oak Ridge National Laboratory in 1947 to remind employees of radiation safety practices a/k/a "health physics," i.e. - how to keep you and yours from glowing in the dark. This morning's Sunrise Serenade was "Moonshine Over Kentucky" by Glenn Miller and His Orchestra. Click on the song title for a sample from emusic, or click here for the album page. 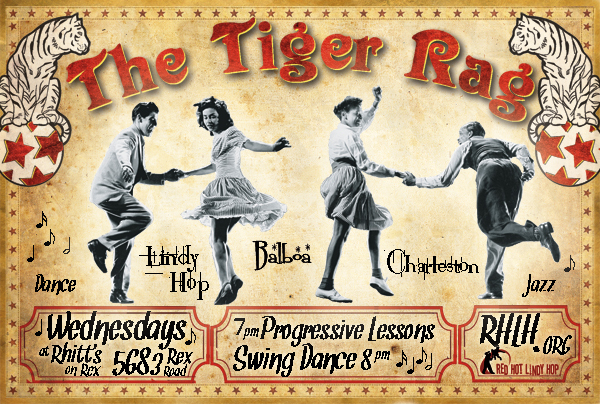 The Tiger Rag happens tomorrow night at the Madison Dance Studio inside Minglewood Hall at 1555 Madison Avenue, and it continues every Wednesday night at 8:00 p.m. You can also sign up for progressive dance classes every Wednesday night at 7:00 p.m. More info here. The Red Hot Lindy Hop lesson and session continues this Friday night at the Rumba Room with free admission and lesson before 7:00 p.m., and $5 cover at the door afterwards. The lesson will be by Kirk and Erin with music by Alexis. Dress like you are going out! Today's Sunrise Serenade was "Wah-Dee-Dah" by Cab Calloway and His Orchestra. Click on the song title to listen courtesy of Jazz On Line. 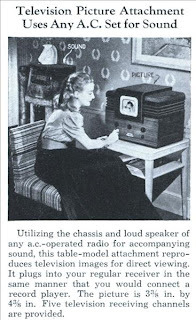 The August 1939 issue of Popular Mechanics, posted on Modern Mechanix, included this little item about a television receiver that used an AC radio as a speaker. According to the article, the TV plugged into the radio set "in the same manner that you would connect a record player." Funny story. I bought an old, 1940's era floor radio in the Summer of 2010, and it had a button labelled "Phono/Tele" for just such a purpose. Here is the funny part. The connection for that 1940's era phonograph or television is the same RCA/phono connector used today on many modern audio/TV systems. Result: I can listen to my downloaded swing music using my MP3 player, a cheap connector cable, and this old radio. No modifications necessary. Priceless. The Swing Shift Shuffle blog is back to normal operations! Our new personnel (Benjamin and Colleen) are still in training, which may require reductions in output occasionally, but we are back to production today. This morning's Sunrise Serenade was "Night And Day" by Django Reinhardt and the Hot Club Quintet of France. Click on the song title to listen courtesy of Jazz On Line. The playlist for the March 21, 2012 broadcast of the Swing Shift Shuffle has just been added to the playlist filing cabinet. The playlist for the March 14, 2012 broadcast of the Swing Shift Shuffle has just been added to the playlist filing cabinet. The playlist for the March 7, 2012 broadcast of the Swing Shift Shuffle has just been added to the playlist filing cabinet. 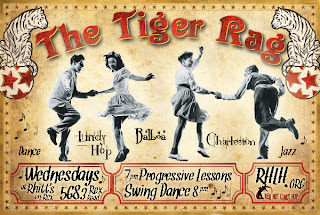 Effective last week, The Tiger Rag moved to the Madison Dance Studio inside Minglewood Hall at 1555 Madison Avenue, and it continues every Wednesday night at 8:00 p.m. You can also sign up for progressive dance classes every Wednesday night at 7:00 p.m. More info here. 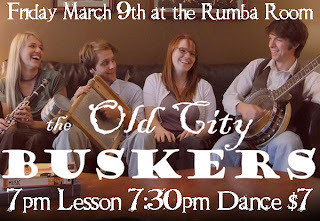 The Red Hot Lindy Hop will feature live music this Friday night at the Rumba Room with the Old City Buskers. 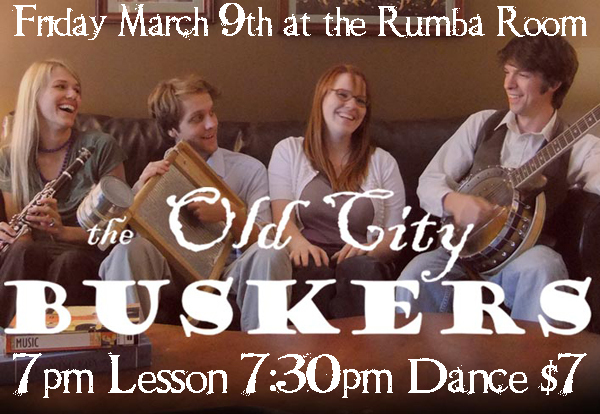 Free admission and lesson before 7:00 p.m., and $7 band cover at the door afterwards. The lesson will be by Jaredan and Michelle. Dress like you are going out! EXTRA! EXTRA! Swing Shift Shuffle Gets New Personnel! Remember that "Special Announcement" I mentioned back on February 21? Well, here it is. I am proud to announce that two new workers have joined the Swing Shift Shuffle. Please join me in welcoming Benjamin (right) and Colleen (left) Taylor to the crew here at the SSS. I am sure they will make a significant contribution to our efforts here. I also need to convey my appreciation for and to Mary Alice Taylor, who obviously played a significant role in the recruitment of these new additions, and who works tirelessly behind the scenes here at the SSS to insure that I can try to bring you posts of at least some interest. B & C will obviously require substantial training, so production at the SSS will be curtailed somewhat for the next few weeks. Playlists and other occasional posts will appear, but daily postings will cease until later this month.